If you're a tech-head, entrepreneur, investor, etc. 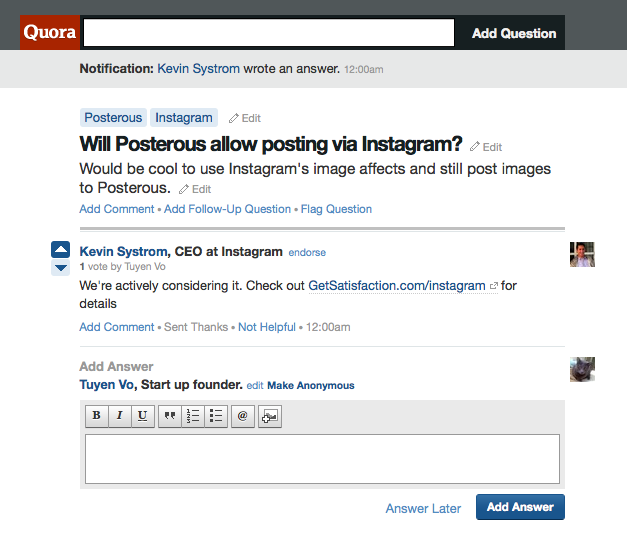 (or just interested in these things), Quora has got to be the number one site on your bookmarks. Where else can you ask a question about a start-up and have the CEO of said start-up answer it? Instances like the one below are the norm and not the exception on this site. What's amazing to me is how many Q/A sites existed before Quora yet never were able to get this depth of users. Every time I go to another site, I have little confidence in the answers given. Granted, Quora isn't as strong outside of the topics I mentioned earlier but I get the impression they'll be catching up soon. One reason may be the fact that there's mostly no anonymity by the answerers. This goes a long way in terms of weighing the value of each answer. If someone else gave me the answer below instead of Kevin Systrom, I'd probably dismiss it.